Rob’s Southern Drawl and laid back sense of humor inject a flavor to Outdoors this Week like File adds to Gumbo. Rob has had articles about him in Mississippi Sportsman and the Clarion Leger, but he has also been published in his own articles for Florida Game & Fish, Mississippi Game & Fish, in the Clarion Ledger, and Hattiesburg American. Rob was hunting alligators in Mississippi before alligator hunting was cool. Alex Langer calls Rob “the Gator Man of Mississippi”. 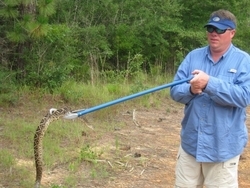 As an agent trapper for the Mississippi Wildlife Fisheries and Parks, he was called in to handle nuisance alligators in a three county area. At the time, Rob relocated the gators to waters where they wouldn’t encounter as many humans, because is his mind, it was the humans that moved into the Gator’s territory. Rob currently relocates wildlife for residence in South Mississippi that request it, snakes being his primary animal that he receives calls for. A firm believer if you kill it you eat it, and a lover of prime aged angus beef, Rob relocates most of the critters he captures live, to environments that they are more suited to. If there is something to be learned about it, Rob loves talking about it on the show. We hope you enjoy his interviews with Fisheries Biologists, Herpetologists, and Biologists from the National Wild Turkey Federation, Ducks Unlimited, and Quail Unlimited.